Leading Wholesale Trader of stereo zoom microscope with touch screen and advanced zoom stereo microscope rsmr series from Pune. 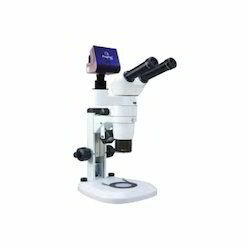 The special characteristic of zoom Microscope is that one can observe the object in three dimensions within the field of view. It is ideally suited for Industrial as well as for Biological Research where high precision, maximum working distance and large field coverage is required. The flat field parfocal zoom objectives provide continuously variable magnification from 3.5x to 180x depending upon the eyepiece and auxiliary lenses used. Touch screen is directly fitted to microscope. 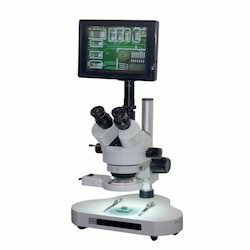 Looking for Stereo Zoom Microscope With Touch Screen ?